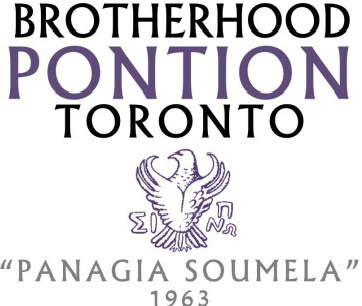 Brotherhood Pontion “Panagia Soumela” of Toronto was established in 1963 as a nonprofit organization. Our Ancestors who are true descendants of Ancient Hellenic tribes and speakers of the archaic Pontic dialect pass on this “passion” for our homeland, Pontos. We are a proud people, frontiersmen of Pontian Hellenism, safeguarding the ancient heritage of our language, our manners, our customs, our dancing, but above all our deep faith in our religion. We endured the Turkish oppression, the horrors and atrocities of genocide towards our people, expulsion and even migration with Panagia Soumeliotissa as a symbol of strength and our protector. From Hellenic mythology we know that “Pontos” was the son of “Ether” and “Gaia” who lived on the south coast of the Black Sea. Also, from Hellenic mythology, Jason, with his Argonaut, crossed the inhospitable Sea. Since ancient times, from the beginning of the 8th C. BCE the Hellenes colonized cities such as Sinope, Amissos, Ancient Temiskyra, Kotyora, Kerasounta, Trapezounta, Argiroupolis, Nicopolis, Amaseia, Heraclea; cities rich of history. The Kingdom of Pontos was an entire Empire! From the Mithridatic dynasty to the Komnenian and Ypsilanti! Twenty-eight Centuries of glorious history! The prestige, impact and radiance of the Brotherhood cannot be reflected in a web page! This is dedicated to these children brought up with the Pontian ideals make us proud we were born Pontian, giving us hope, courage and strength to fight for the next Years. With clear proof, our Pontian culture, dialect, morals, customs, music and dances will endure in the next generations. This web page is dedicated to all those who worked tirelessly over the years and made the Brotherhood Pontion Toronto “Panagia Soumela” a “BEACON” of Pontian Hellenism, not only in Canada and America, but worldwide. We have carried the heavy burden of keeping our culture alive. We transfer our legacy to our worthy youth who have shown a great sense of responsibility that seizes the continuation of this important and valuable work.